Steel Dome-Top Trash Receptacles 15 gal. Great design, practical features and the strength of steel all come together in this surprisingly stylish trash can from Witt Industries. It's the perfect solution for schools, offices, restaurants, reception lobbies or anywhere else where the details really count. 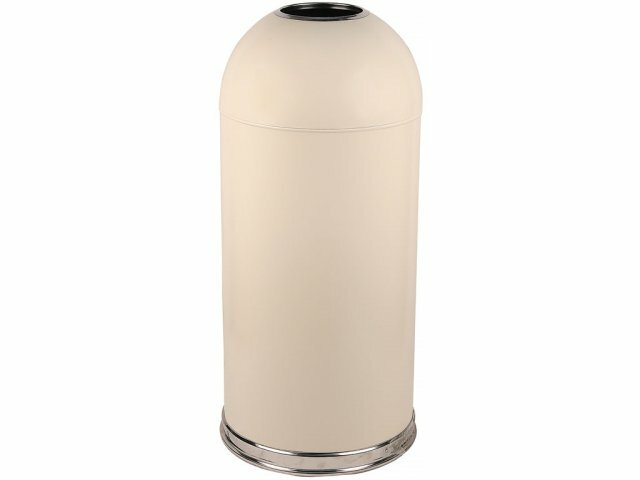 These dome-top trash receptacles feature an open top for hands-off, clean waste disposal with no need to touch the can. The heavy-gauge steel shell is highly durable and fire safe, and features a rolled-under, stainless-steel bottom to protect floors from scratching. Galvanized steel liners are included to protect the trash can interior from dirt and grime and make servicing super-easy. Available in a choice of classic colors, these trash receptacles really add a finishing touch to environments where the small things make a big difference. Attractive Design: Classic design and dome top make this trash can a highly attractive addition to any interior decorating plan. Extra-Durable: Heavy-gauge steel shell is fire safe and highly durable, for long-term everyday use. No-Scratch: Rounded, stainless-steel base protects floors from scratching. Hands-Off Disposal: Open, dome top allows for totally hands-free waste disposal for enhanced sanitation. ADA Compliant: These trash cans are full accessible by all segments of the population, making them ideal for companies and schools with special-needs clients.